Ulster A will take on Leinster A in the opening round of the new Celtic Cup at Malone RFC on Friday evening (kick-off 5.00pm), and Chris Henry will lead the side out on the familiar surroundings of his home club’s ground. Henry, who is celebrating his testimonial year, will wear the number 7 jersey and will be joined in the back row by Caleb Montgomery and Greg Jones. Schalk van der Merwe and Rodney Ah You will prop either side of Banbridge RFC’s Peter Cromie, with Peter Browne and Alex Thompson completing the front five. Behind the pack, Jonny Stewart and Johnny McPhillips will combine at half-back. Abbey Insurance Ulster Academy Year One winger Iwan Hughes, Aaron Sexton and Peter Nelson make up a pace-laden back three, with James Hume and Jack Owens paired together in the Ulster midfield. Matthew Rea, who hasn’t featured since picking up an injury in a Man of the Match performance versus Ospreys in April, is set to make his comeback off the bench. His brother Marcus, Paul McGookin, Peter Cooper and Michael Cromie are the other forward reinforcements. Graham Curtis, Bruce Houston and Michael Stronge will provide the backline options among the replacements. 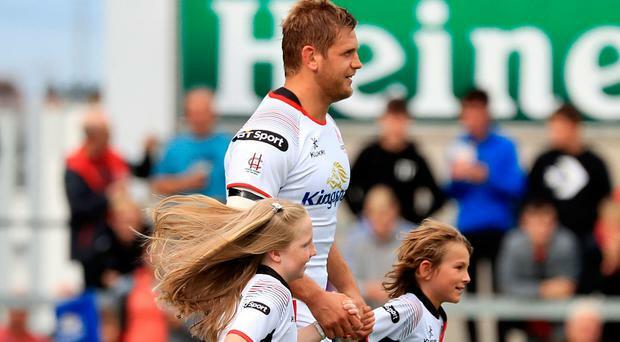 Admission to the game is FREE, with voluntary gate donations in aid of Chris Henry’s Testimonial Charity. (1-8): Schalk van der Merwe, Peter Cromie, Rodney Ah You, Peter Browne, Alex Thompson, Caleb Montgomery, Chris Henry (C), Greg Jones. Replacements: Paul McGookin, Peter Cooper, Michael Cromie, Matthew Rea, Marcus Rea, Graham Curtis, Bruce Houston, Michael Stronge.